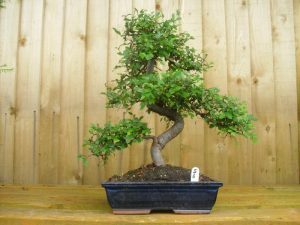 Chinese Elm bonsai trees are probably the most common kind of bonsai and generally the first one most people will own. WIthout some information on how to look after them they are also usually the last one they will ever have after it struggles and then finally gives up. They are tough and able to survive the hazards of life indoors, difficult for any tree. Chinese Elm have very small leaves, rugged bark, fine branches and nice roots. Large trees have real charisma and the wow factor. Small ones can be bought cheaply. The tree is semi-decidious and will either keep or partially loose its leaves depending on the conditions in which is it kept. To my mind, location is the biggest factor in success when keeping bonsai trees indoors. A coffee table isn’t going to work in the middle of a sitting room. A bookshelf will be too dark. Almost everywhere that you see them in films and on TV won’t work, the bonsai tree has been put there for the filming. Sorry to burst the bubble, but its quite true. Bonsai require a bright position, if you are going to keep one in the house please avoid dark corners. Indoor bonsai trees want plenty of light, so a bright sunny windowsill works well. The main problem with this is that in summer, it will be very hot. ideally, you want the light without the heat, which is hard to do. Solutions to this problem including bigger pots, bigger trees, drip trays, mist spraying and moving the bonsai tree in summer. A bigger pot relative to the tree will provide a larger reservoir of soil, meaning that the tree will dry out less quickly and that the moisture in the soil evaporate, making the air around the tree more humid. A bigger tree is more robust generally, as they have more roots. A drip tray underneath the pot will collect some water, more humidity. Mist spraying will again increase the humidity (you get where i’m going here – they like a humid environment.) If you can, a few months outside will help a lot, do this is summer, to avoid the dry, hot window in summer. If outside, the tree is not fussy. I grow them outside in full sun, partially sun and full shade. They are all very happy. When I first started growing bonsai trees, I used to think that Chinese Elms were sensitive to the cold. Over the years and with experimentation, I have found that they are amazingly hardy trees that can withstand cold and temperatures down to around minus ten degrees. The big plus in growing them outside this that the leaves are much smaller and the growth is much tighter, as they the not putting out big leaves in attempt to hoover up as much light as possible. “Do you remember that horrible winter a few years ago when it dropped to minus 15? That is the only winter that i have lost Chinese Elms to the cold.” Another shop quote. Aim to maintain an even level of moisture. Balance is key. You can rot plants roots through too much water. Equally too little water has more obvious consequences. If the leaves curl up, go dry and crispy, this is a sign of drying out. Indoors, the most simple way to water is with a cup or jug. Just pour water onto the soil surface. Water until water runs out of the holes in the bottom of the pot. Most of the roots are in the bottom portion of the pot, so if you only give them a bit of water, the top will look wet, while the majority of the roots are actually dry. You can also dunk the whole pot and soil in a bowl of water in order to make sure that you haven’t missed any part of the root mass. After that, leave it to drain on the kitchen drainer or outside. Yes some people do this, the idea being to increase the humidity around the tree. It will increase the humidity around the bonsai. I need to point out though that i have have had Chinese Elm bonsai trees growing on my south facing kitchen window for years and have never ever mist sprayed them. “Will I have to prune it?” is a frequent question I get asked asked at our place. The answer is most definitely yes. Don’t worry, its a good thing! The most simple answer to the question how to prune Chinese elm bonsai trees is to let each shoot grow to a couple of inches and then to prune back to the first four leaves. You’ll notice that they start off quite small and get progressively bigger as the new shoot grows. You are usually aiming to maintain the existing shape, IE a triangle shape with a dome crown. anything that breaks this silhouette can be removed. Plus, any shoots that grow downwards can be removed. Trees in nature don’t tend to do that. You want your Chinese Elm bonsai tree to get bigger and better over time. So how can this happen? I always say that it won’t magically expand or rise over time like a Yorkshire Pudding does. Instead, the pruning is like topiary – you carefully prune the tree allowing bits of growth to continue in the way that you want it to. The aim of the game is often to increase the twiggyness of the bonsai tree, rather than the height. Think about it – one cut shoot generally leads to two smaller side shoots, which when cut lead to four smaller shoots. Feeding can be done all year round with a tree kepy indoors. Use either a low strength liquid feed or slow release granular feed. If you’ve just recieved a Chinese Elm and are looking into how to keep it, don’t feed it for the first few weeks. Give it chance to settle into its new environment before starting to feed. Chinese Elms grow quickly and should be regularly repotted. Small bonsai will want repotting every year to keep them in the best of health. Here is some helpful advice on how to do this.